Weight loss surgery and the new lifestyle represent a major undertaking, both by the attending physician and by the patient. At Olde Del Mar Surgical in La Jolla, Calif., our bariatric surgeons have achieved an extremely high success rate when it comes to patients losing weight and keeping the pounds off following weight-loss surgery. If you’ve had bariatric surgery, you might be shocked to learn another procedure may become necessary. But there are actually many good reasons why you need a revisions or conversion of the surgery you originally underwent. Let’s examine the hows and whys of bariatric revision/conversion surgery. One of the principal reasons to switch from one type of bariatric procedure to another is a failure of the original surgery to address metabolic issues that contributed to your obesity. For example, even though you may be consuming much less food thanks to your gastric bypass, gastric sleeve or lap band surgery, you may continue absorbing too many fats through the small intestine for your particular metabolism to handle. As a result, your weight might plateau or increase after the initial loss. A trained surgeon, like Dr. Sunil Bhoyrul and his Del Mar surgical team, can often resolve this problem. Sometimes the existing surgery simply needs some adjustments. Your stomach pouch might have expanded a bit over time, for instance, or your lap band may have slipped out of position, either of which can allow you to consume too much food for proper weight control. Patients with a gastric bypass may need either a gastric bypass revision (aimed usually at making an enlarged stomach pouch smaller), or placement of a gastric band around the pouch to help with better restriction. Patients with a previous stomach stapling (Vertical banded gastroplasty) may need conversion to a gastric bypass, and patients who have had problems with their lap band may benefit from conversion to a sleeve gastrectomy or gastric bypass. Some patients who have chronic problems with a sleeve gastrectomy may also benefit from conversion to gastric bypass. A second procedure might be all you need to resume your new, slimmer life. Another reason for an additional bariatric procedure could be unpleasant side effects from the original weight-loss surgery. Some patients experience ulcers, gastric dumping or both following a traditional gastric bypass. 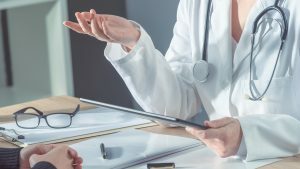 The staff at Olde Del Mar is proud to offer all these options, as deemed appropriate, and are usually able to perform our bariatric revision surgeries using laparoscopic techniques, even in circumstances where patients have had previous open surgery. While revisions and conversions can prove remarkably effective in fixing bariatric surgery issues, bear in mind you must also do your part to make your original surgery as successful as possible. That means sticking to the dietary programs, exercise plan, and any other prescribed counseling designed to help you keep that unwanted weight off without the need for additional surgery. Interested in learning more about Olde Del Mar Surgical’s bariatric procedures or revision surgery, call our office 858.457.4917.